I have always liked shooting 35mm for the conveniences of the greater number of exposures per roll and smaller lighter cameras. Heading out with one or two 36 exposure rolls can cover a long day's worth of shooting with limited bulk. The downside to this, when working with a hybrid analog/digital workflow, is exponentially higher time spent scanning once the film is developed. Up until this point, I have been using a Minolta Dimage Scan Dual III and Silverfast's SE Plus scanning software for all my 35mm scanning needs. This scanner software combination is capable of producing great scans, but workflow can be slow and tedious. So much so, in recent years, I have shied away from shooting 35mm in favor of medium format. Not all together a bad thing, but I do miss the more casual nature of shooting 35mm. I am much more likely to keep my Olympus XA2 or Stylus in my pocket for day to day shooting, than lugging one of my Kiev 60s or even my point and shoot Fujifilm GS645Zi. Hopefully my most recent scanner acquisition will even the playing field for back end workflow between 35mm and medium format 120 film. 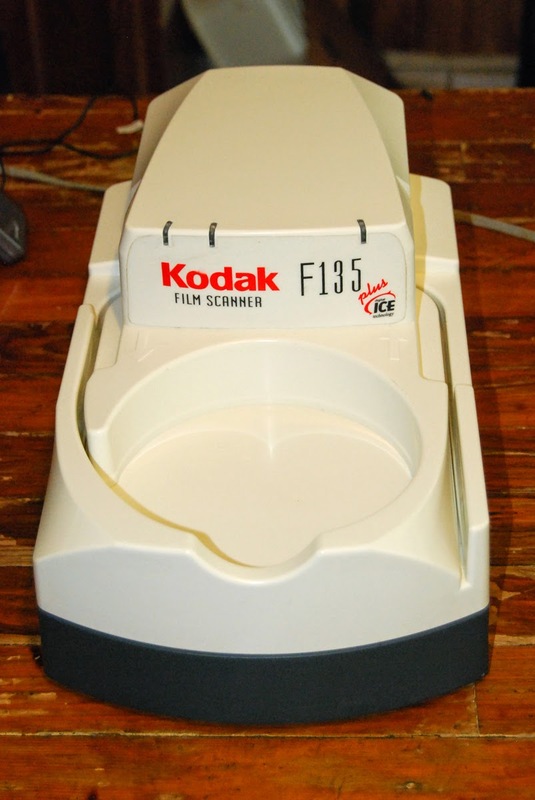 The Kodak/Pakon F135 Plus is a 35mm roll film scanner designed for low volume analog/digital retail labs in the early 2000's. You would commonly see them in chain drug stores supplementing their digital printing operations. I know, I installed a few of them as a field service technician in a past life. They were a way for smaller locations to have film scanning and printing capabilities without the foot print or capital investment of the high end Fujifilm Frontier hybrid digital systems that the bigger retailers were installing. Made by Pakon with Kodak branding the F135 Plus was no speed demon when compared to the higher end scanners of the day, but it would scan a full, uncut roll of 35mm film in a few minutes. Coupled with one or two tabletop dye-sub printers and a CD burner a lab could have a reasonably capable analog/digital lab in a small foot print. The quick rise of digital as a replacement for film brought and end to Pakon, which closed their doors a few years back, so the once $2,000+ scanners can now be found ebay selling for around $250. Due to their age, you must keep in mind that the software only works with Windows XP and there are no Mac drivers available at all. That being said, the software will work on a Mac running Windows XP on Parallels Desktop and I have seen a few reports of it running on Windows 7 in XP mode. Luckily I had an older Dell Dimension 4700 laying around that had more than enough horsepower to handle the software. I have installed the software and done some initial test scans and I have to say I am pleased with the results. The 2941x1960 pixel 16 bit RGB scans are very good quality, perfect for proofing and prints up to 8x10. Digital Ice dust and scratch reduction technology is built into the scanner and appears to be effective in reducing negative imperfections during scanning. The software is not pretty or intuitive, but it is functional and relatively easy to learn. The initial color and exposure judgements made by the software are close and can be tweaked before exporting the files. For critical work or large prints, I can still fall back on my Dimage Dual Scan III, but for getting a decent initial scan onto my computer, this is a great new tool. I will not dive into operational specifics, as the are a number of great tutorial already up on the web. A Google search for Pakon F135 Scanner will get you started. Sample scans to follow in futures posts. Nice. I was fortunate to get an F335 right before the ship sailed, can't wait to get it up and running!